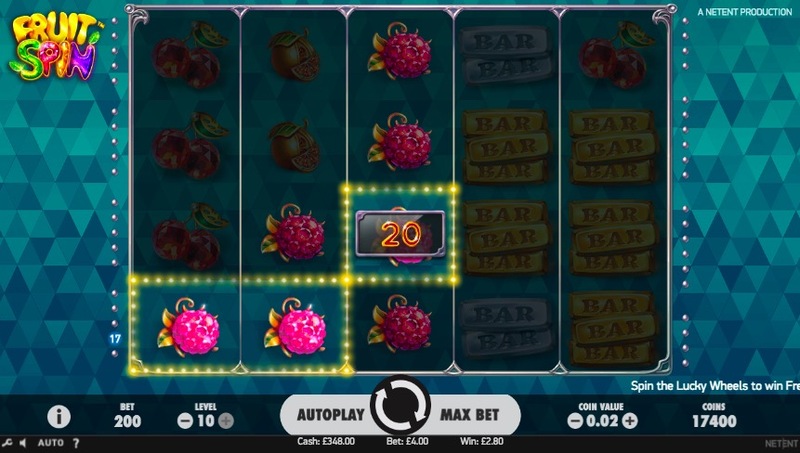 If you enjoy classic fruit machines but don’t want to miss out on modern video slot features, Fruit Spin is a fantastic option. 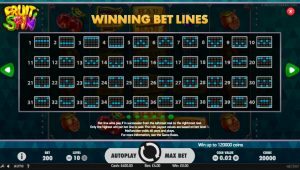 It mixes in contemporary features while remaining true to what has made this kind of slot game so popular for so many years. That includes favorable, straight forward odds. Fruit Spin is intentionally minimalistic. 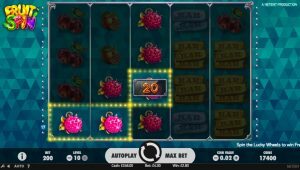 It forgoes flashiness and elaborateness in favor of fruit machine basics with a splash of video slot pizazz. The colors and design are gentle, and the atmosphere is set with lounge-style music that plays in the background. Less is more was clearly the design goal, but that extends only to the aesthetics. This game is lucrative for casuals and high rollers alike. 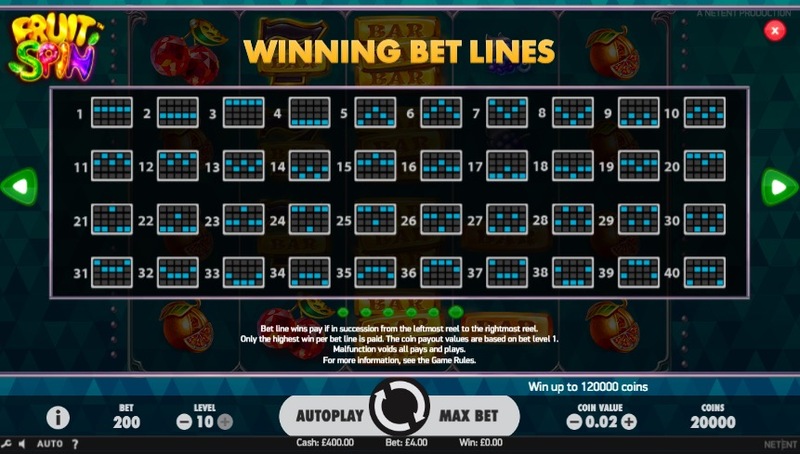 Fruit Spin features five spinning reels and 40 bet lines. The bar and seven symbols are particularly worthwhile, but even the basic fruits can pay out well and add up fast with numbers. 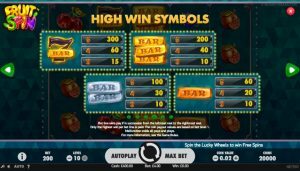 There are some useful special features as well, which can award free spins and shift the odds in your favor. Fruit Spin makes the most of its five reels and 40 lines with the help of a pleasant atmosphere and a refreshing lack of graphic distractions. As you’d expect from NetEnt, the symbols, despite being minimalistic, are very eye-catching. It makes it simple to remember which symbols do what. 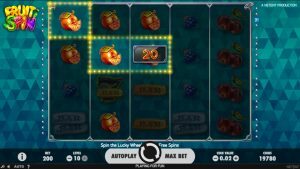 Lucky Wheel: This is one of Fruit Spin’s most prominent features. Its activated by scatter symbols which appear in arrangements of three and up to a 3×3 grid. 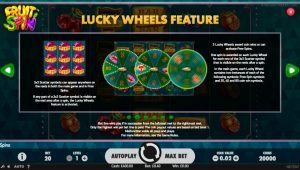 Depending on how many scatters you get, you get so many spins on the wheels, and those spins can result in coins or free spins. 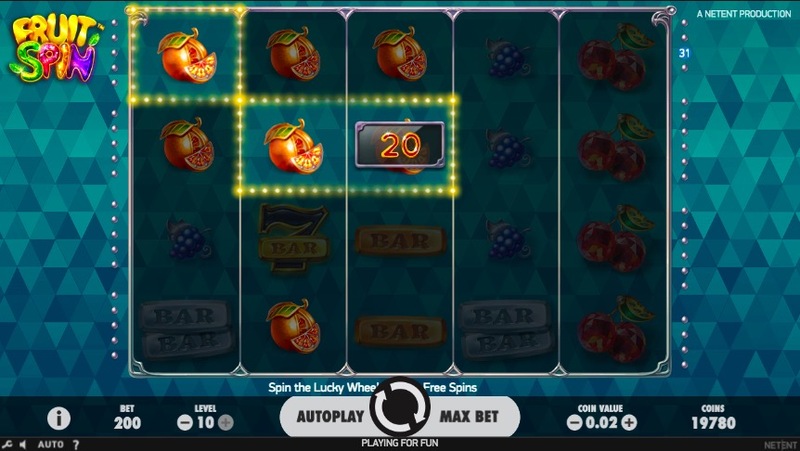 During free spins, there’s an extra spin symbol. Each time you hit this, you get an additional spin, and there’s no limit to how many free rounds you can get in this manner. The scatters are also active during free spins, which can trigger the Lucky Wheel again and again and again… You get the idea! Wild: When the largest scatter symbol appears during a free spin in 3×3 form, it serves as a wild symbol. The wild increase the total payout potential for a spin enormously. In fact, it’s possible to win 600 times your stake for that particular spin. 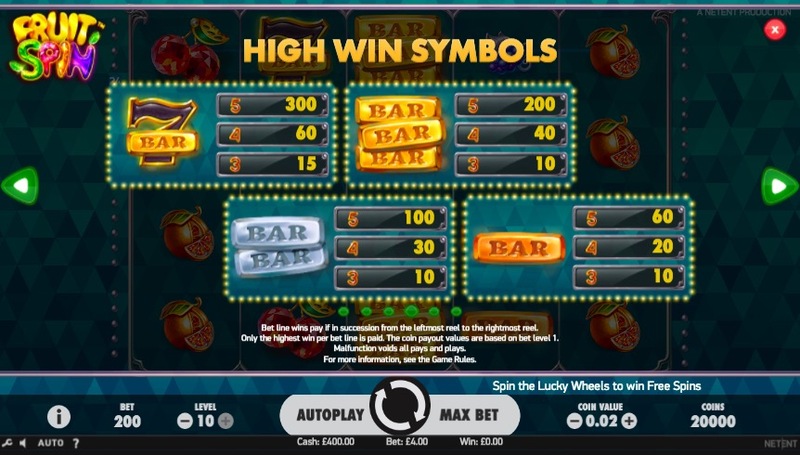 During both the main game and free spins, all symbols appear as stacked symbols on the reels. The exception to this is the 3×3 wild symbol and the 3×3 scatter symbol. Stacking means that symbols will generally appear horizontally in groups of two or more. In the main game, Fruit Spin has an overlay reel that contains 3×3 and 2×2 stacked versions of all non-scatter symbols and 3×3 stacked versions of scatter symbols. 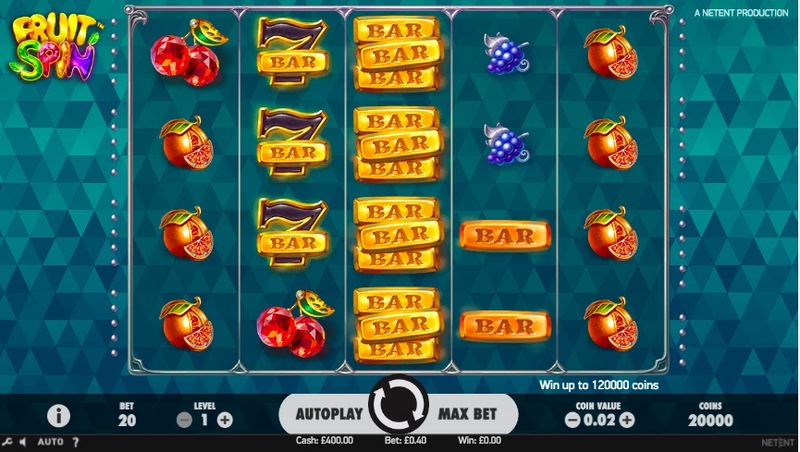 During free spins, that overlay includes the seven, golden, silver and bronze bars in 3×3 configurations. It also includes a 3×3 wild symbol and a 3×3 scatter symbol. If there’s one thing Fruit Spin does well, it’s bring the fruit. This is true graphically but also in terms of classic fruit machine features. 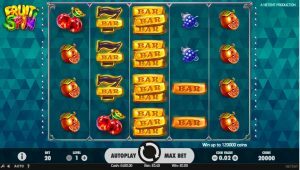 Nevertheless, NetEnt isn’t satisfied with just achieving the status quo, and so we get some variety to the classic fruit machine as well as some very NetEnt-like touches. 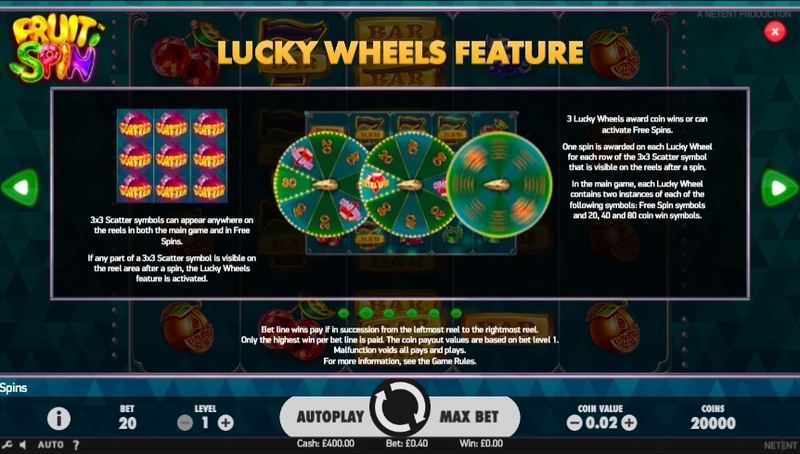 Perhaps the most notable special feature is the Lucky Wheel, which delivers more chances to win through direct payouts as well as free games that can trigger additional free spins. This mode isn’t stingy about the free spins either and can even let you spin yourself into an infinite free spin loop. Outside of that, the game doesn’t have a lot of bells and whistles. These no lavish backgrounds or dazzling effects, but there’s an attractive, consistent art style and a pleasant music accompaniment. If you prefer something with more modern action, then consider Dead or Alive or Dragon Island, which are also by NetEnt.